On this blog we mostly talk about topics from the video games consulting part of ICO Partners, but we also have an excellent Public Relations team working on a wide range of clients and titles (from big players like SMITE, Fractured Space, Endless Legend to indie titles such as Evoland, The Lion’s Song and Fragments of Him). 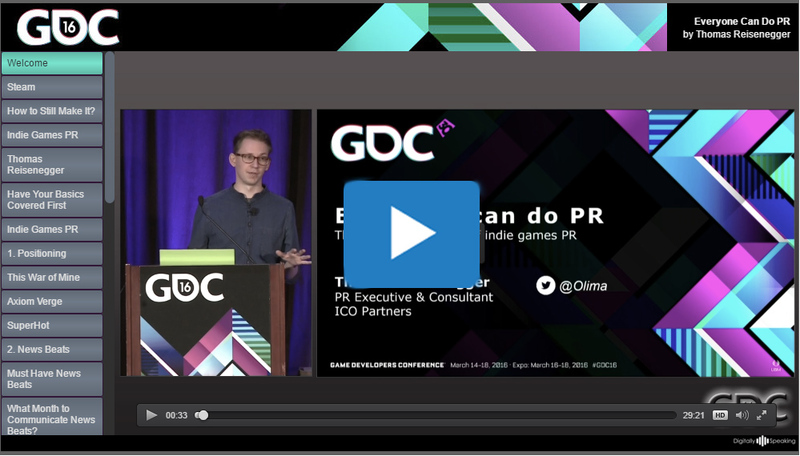 This April I did a talk at GDC about indie games PR titled “Everyone Can do PR – The 5 Pillars & Pitfalls of Indie Games PR”. You can watch the talk for free on the GDC Vault by clicking on the image below. You can also check out the slides and download them here. Like last year, I have put together a quick summary of the media coverage the Game Developer Conference received. If you have a look at last year’s blog post, you will see the methodology for measuring events’ media coverage has evolved. For events, I am looking at the “Key 20 days”, standing for the 9 days prior to the events and the 11 days from the beginning of the event. For topics, like last year, we look at the coverage for the whole week, from Sunday to Sunday that specifically mentioned the event. For anyone attending, this year was a really impressive GDC. The halls were busy right from the beginning of the week and this is the first time since I have been attending the event (about 15 years out of 30 years of its existence) that I saw sessions showing as being full on the Monday. Surprisingly, the official press release after the event that shows attendance numbers, announced the event has only grown from “more than 26,000 visitors” to “more than 27,000 visitors“. 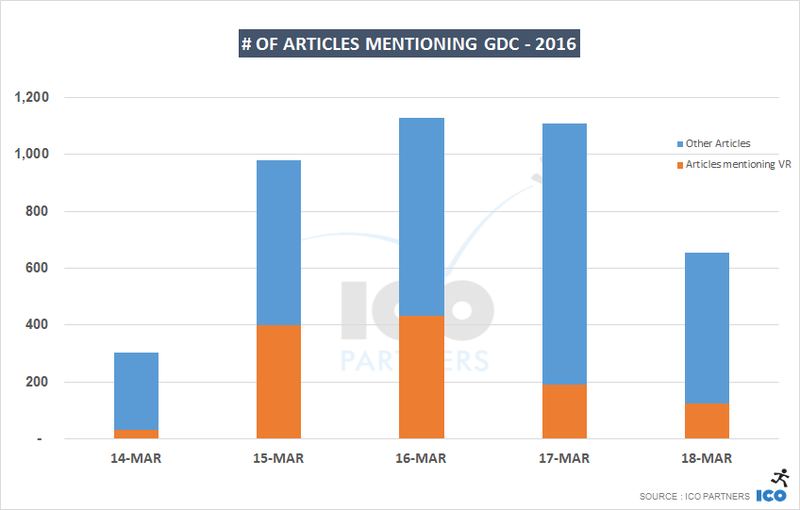 Where does GDC 2016 stand from a media coverage perspective though? 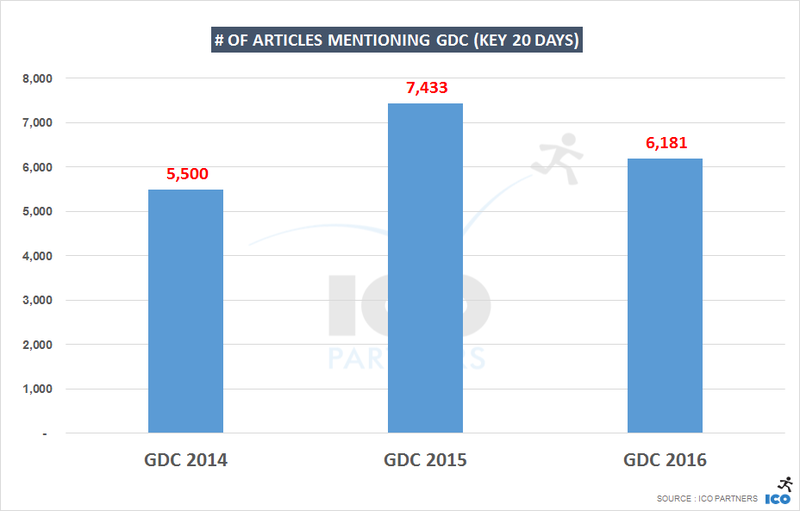 There has been a slight decline in the number of articles mentioning GDC this year. It still saw more media coverage than 2 years ago though, and this is a significant amount of media attention for a professional event. 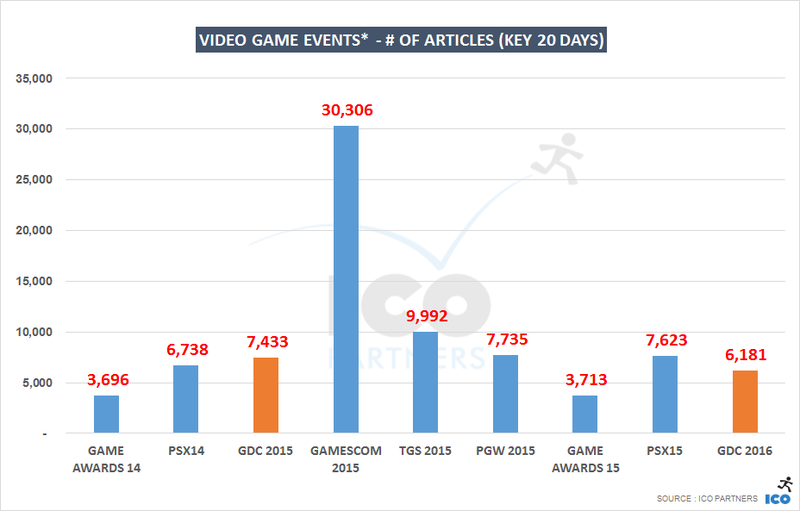 The fact is, even more than other comparable events, GDC media coverage is very dependent on the profile of the announcements made during the week and there are no staple press conferences like the ones at E3 or gamescom. Last year’s HTC Vive reveal, or the Unreal and Unity shifts of business models announcements might be at play here? The single biggest news in this 2016 edition was the Playstation VR’s price point though, but more on this later. * Just a reminder that E3 is missing due to technical limitations with our tools. 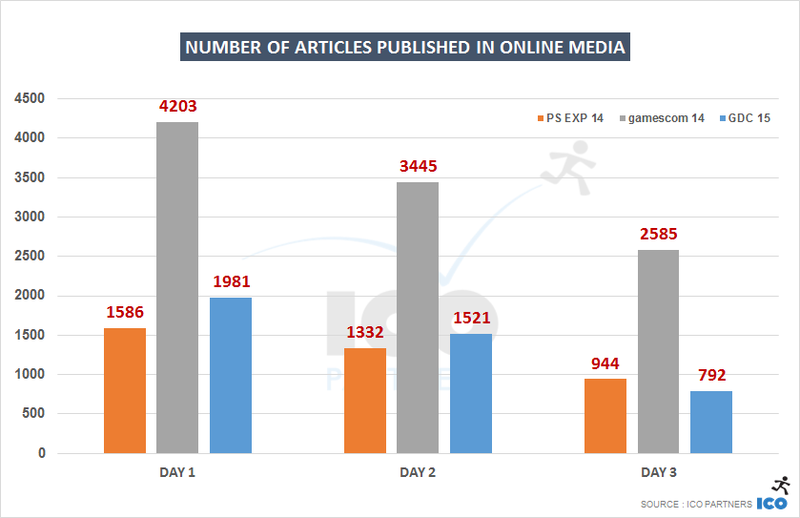 The GDC stays in the same range of media coverage as the Playstation Experience or the Paris Games Week (the one with the Sony Press Conference). However, there is one metric on which it stays ahead. I have mentioned in the past, we give different media outlets a score based on their Alexa ranking. The better the ranking, the higher the score, up to a maximum of 10. This score doesn’t feature very often in the blog post as it is not always relevant and I also try to keep things simple (even if sometimes I fail despite various experiments over on Twitter). 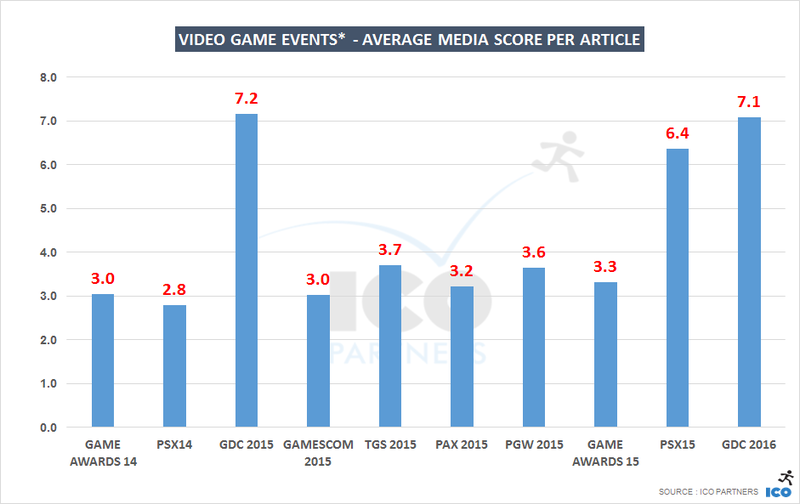 The following graph shows the average score for the articles covering different game events. It is quite telling. 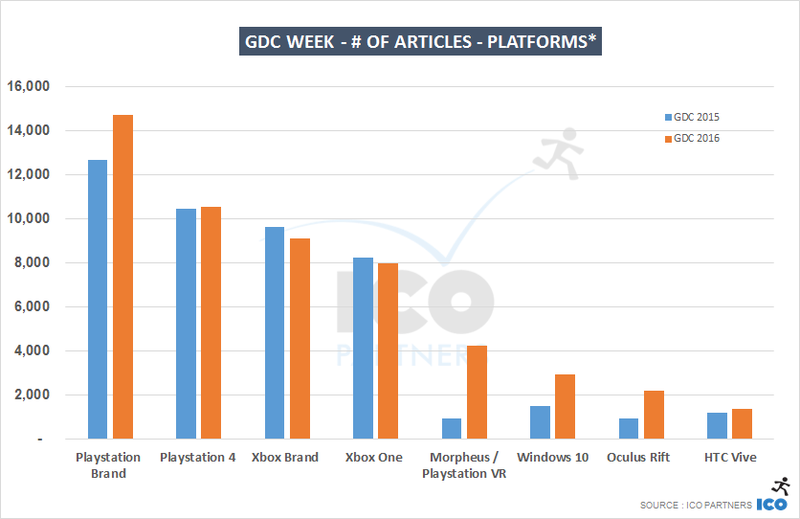 With the exception of the Playstation Experience 2015, the GDC is standing head and shoulders above the other events in terms of the profile of the media covering it. 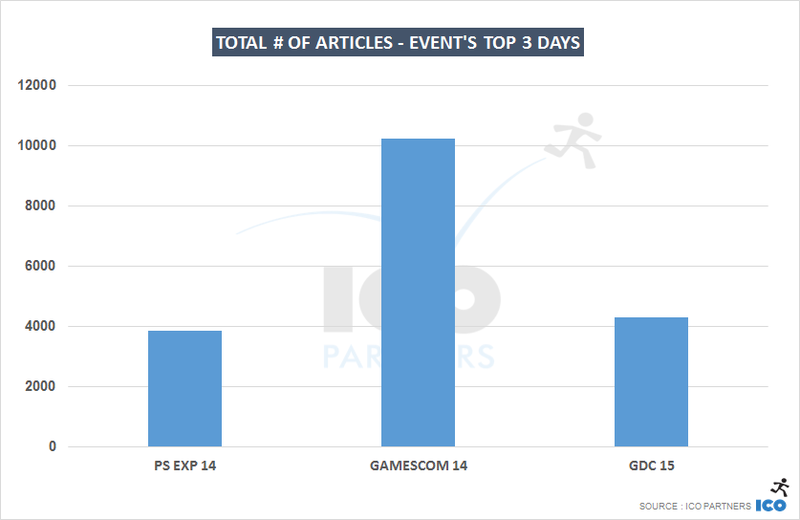 More articles are written that mention GDC from large websites than any other event, and this might be stemming from the professional dimension of the event. More than any other event, GDC sees more announcements related to game engines and professional software and it is always interesting to see which one is coming on top each edition. This year was light on announcement around game engines, especially compared to last year. Crytek’s “Pay what you want” communication being the one standing out once the dust settled, but it still didn’t rock the world the way Unreal’s communication last year did. 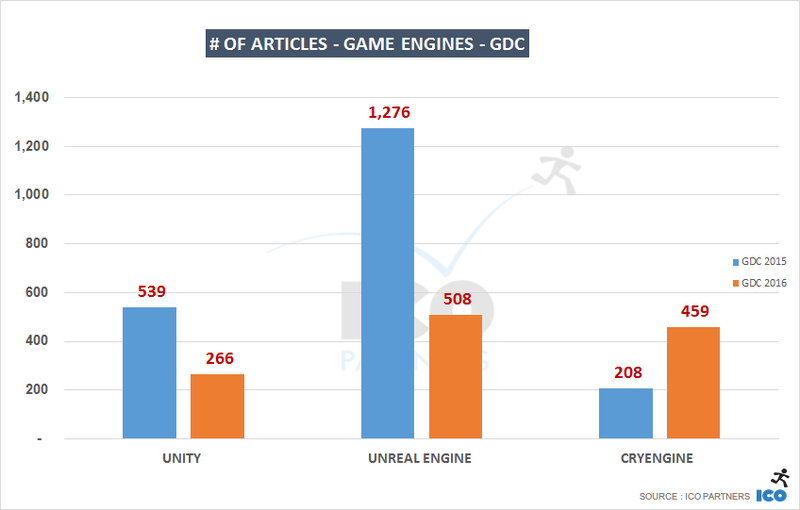 While it seems the decline in media coverage from last year could be explained purely by the fewer articles on game engine, it is time to address the biggest topic of this year’s GDC. No question about it, between the eminent release of the Rift, and the Playstation VR announcements, there has been a lot of media coverage for Virtual Reality the week of GDC. 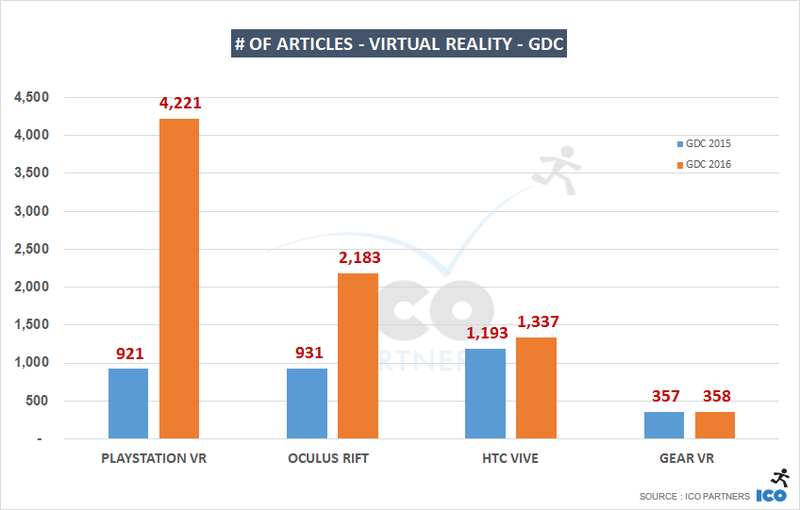 In those five days, 28% of articles mentioning GDC are about VR. 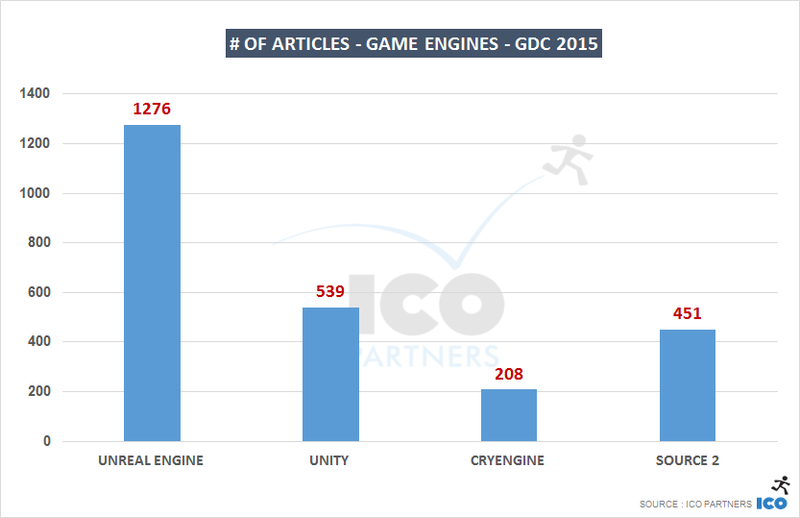 On the 16th of March, the day with the most articles related to the GDC, 38% of those articles mention VR. 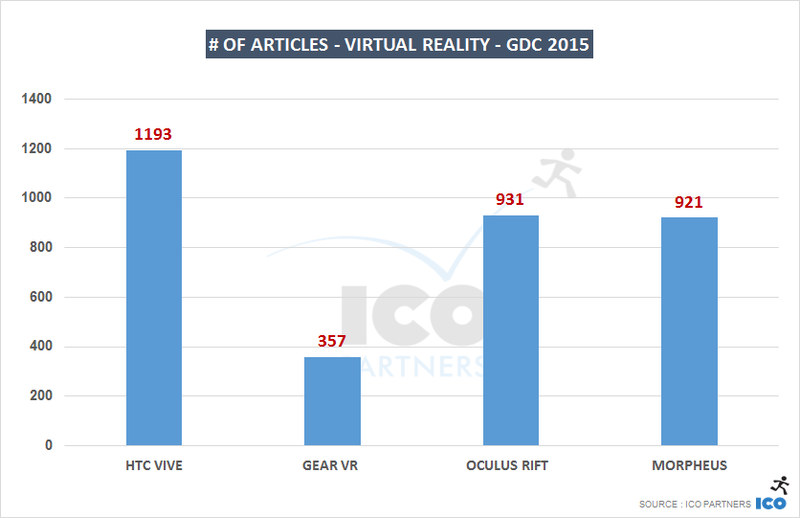 Even on the 17th of March, where VR is only in 17% of GDC articles, it was the dominant topic. 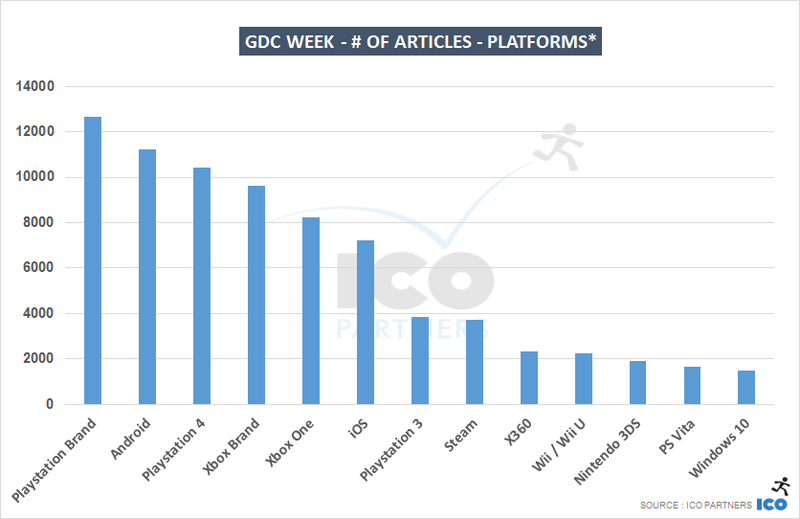 Looking at the evolution from one year to another in regards to the platforms and their coverage during the GDC week. Things have stayed more or less at the same level for Xbox. There was quite a bit of news from Microsoft though, between the announcement they would open their platform for crossplay and the doubling down on the ID@Xbox commitment. Playstation obviously is surfing on the Playstation VR wave, and probably has a few more things related to this up its sleeve for E3. Leading up to June, it will be interesting to see how much Sony builds up on the momentum that the VR hype has created.